In Lindsey Lohan's case, it was all too much, too soon. She began her modelling career at a tender age of three, and became one of the most sought-after child model. Then, she pleasantly surprised everyone with her performance in the super-hit film  The Parent Trap. As a teenager, the Hollywood starlet exhibited the potential of giving many actresses a run for their money. LiLo, as she is fondly called, successfully established herself as a singer, dancer, and actress. But lately, the Herbie: Fully Loaded star has been in news for all the wrong reasons. Controversy has become her middle name, and everything she does hits the headlines in the tabloids. Her involvement in substance abuse, drug rehabilitation, shop lifting, car accidents, imprisonment, disturbed family life, and a few disputed romances- the list of controversies is unending. To mention the latest, she has been accused of stealing a necklace from a jewellery store, and has been fighting a legal matter for the same. Well, one can't blame the media for making a mountain out of a mole hill when it comes to Lohan. Will Lindsey Lohan be able to put everything back in the right place? Or is the downfall far from over? With Vedic astrology, Ganesha finds out what the future holds for the young artist. Ketu will be transiting over her Natal Sun till 6th June, 2011. Jupiter turns in her favour by entering Aries on 9th May, 2011. Saturn will maintain its Square with her Sun till November, 2011. Rahu will be transiting over retrograde Saturn in her Natal chart after 6th June, 2011. When no major transits are operating, one would be operating as per the Natal characteristics, widely known as 'Natal promise' in astrological terms. When there is nothing much going on with Lindsay at the cosmic plane, she would still be in the limelight due to her Venus in Cancer and Moon  Rahu in Aries. Her Sun-sign is Cancer, and she has Venus in Cancer which makes her hyper-sensitive, especially in matters of love and relationships. Therefore, these elements are going to keep her under the limelight throughout her life. Moreover, Rahu Ketu in Aries and Libra are responsible for a strong emotional turmoil. 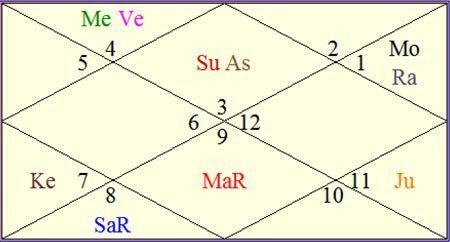 As per the Universal Zodiac System, if this combination hits at the first House and the seventh House axis, it often keeps personal life disturbed. In Lindsey's case, she may face identity crisis in her life, feels Ganesha. The court has announced that there will be no jail for Lohan, till 6th June, 2011. However, she is under the inimical transit of Ketu over Natal Sun. Therefore, she will have to be extra careful. Her social image will be under the scanner till then. She will also have to watch her words and actions at least till November, 2011, as transiting Saturn will maintain it's Square with Sun till then. With the entry of Jupiter in Aries on 9th May, 2011, she will surely have a moment of respite and will be able to rebuild her social image. She shouldn't be missing out on this chance. She has to stay miles away from any intoxication or addiction till the end of the year, as it can spoil her image again, feels Ganesha. Sometimes people born with disturbed Moon or Venus take help of such things to forget their pain. In Lohan's case, her disturbed personal life and her relationship with Samantha Ronson have already taken a toll. So, she will have to be extra careful. In short, Ganesha feels that Jupiter's transit is turning in her favour, however, till the end of the year, she will have to be very careful when it comes to her social image.